Ramblewild provided the perfect conditions for me to overcome this fear of fear. In addition, after you leave, there is a sense of accomplishment that stays with you and that seems to carry over into other areas of your life. You just feel a bit bolder and more daring after you face down a fear like this. 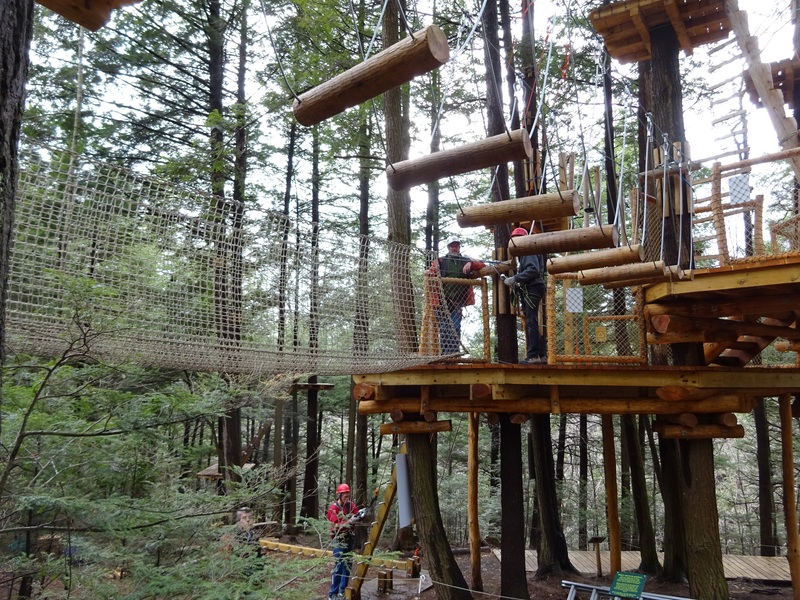 Recently I went to an "aerial adventure park" called Ramblewild in Lanesborough, Massachusetts. 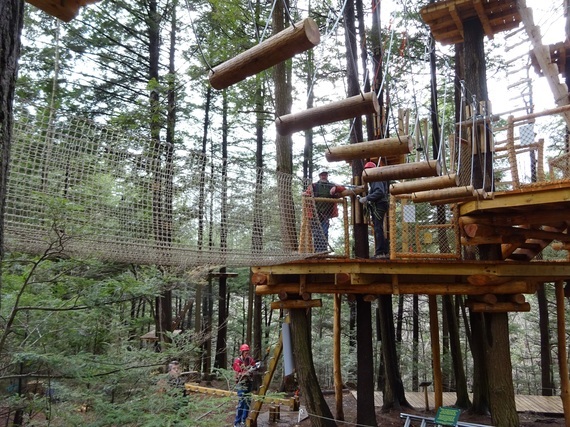 It's a kind of playground (for adults and children) built high amongst the trees in the middle of a pine forest, deep in the Berkshire Mountains. Apparently these kinds of recreation areas where you ride on zip lines, climb on wires and navigate shaky catwalks between trees are very popular in Europe. When I arrived at the gate, I didn't know whether I was just going to OBSERVE the place, or actually experience it. I didn't rule out the possibility that I might SOMEHOW summon up the courage to TRY what this park had to offer, but I didn't rule out the possibility that I would ultimately "chicken out" either. 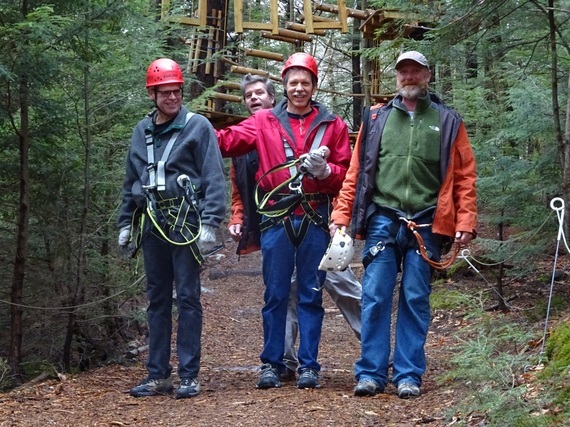 Having grown up going to amusement parks and watching from the sidelines while all my friends rode death-defying roller coasters and the rides that go upside down, I knew that actually experiencing Ramblewild would be a real challenge for me. One of the things that makes stress so difficult to study is often illustrated by this classic dichotomy between those of us who hate roller coasters and those people who love them. This difference of opinion often confounds the scientists who study stress because ALL things stressful are not uniformly stressful to everyone. Basically there's almost always someone who ISN'T bothered by something that other people find stressful like public speaking, bungee jumping, carrying huge amounts of debt and even handling snakes! How can we draw any conclusions about what is stressful when we can't even agree on what causes it? And from the point of view of this dichotomy between things being stressful and challenging, and not stressful and therefore boring, my assumption was that a place like Ramblewild would come down solidly on the side of: who cares about the people like me? But from the minute I arrived at the gate and met Paolo Cugnasca, one of the owners of Ramblewild, he seemed to indicate that his park would offer a middle ground between the two. And even more importantly, it would provide me (and others like me) a way to move from being afraid of this activity to being appropriately challenged by it. That being said, when Paolo showed me the harness that I would need to wear I immediately started having second thoughts. Ironically, he was telling me how safe the harness was and how it could never be completely detached from the wire (because when one of the hooks was open, the other was automatically closed). His little pep talk had the opposite of its intended effect. I could feel my palms getting sweaty and my heart pounding in my chest. 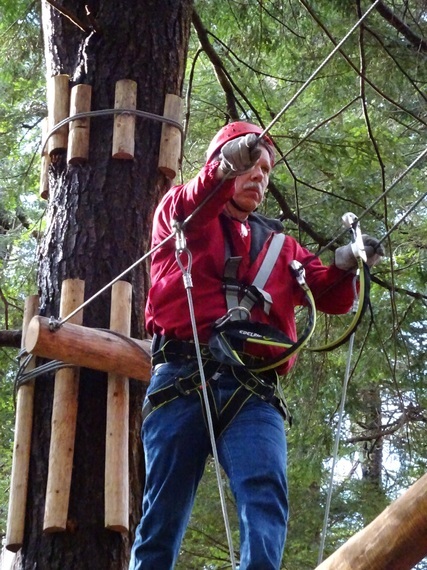 I kept imagining myself dangling from some wire sixty feet above the forest floor. "I'm not sure I can really do this," I confided, feeling timid and already defeated. Paolo was very reassuring. "Let's go up to the course and just take a look. Then you can decide how you feel about it. If you don't want to do it, you will enjoy just walking the grounds and seeing the forest. A lot of families come to Ramblewild and some family members stay on the ground and cheer on the ones who are climbing around up above. But we'll take the harness along just in case you change your mind." This reverse psychology worked perfectly on me. When we arrived at the first platform - what they call the hub - I decided to give it a try. Especially when they explained that just like a ski hill, there were multiple levels and I could take the beginner's level to start. The Ramblewild guide-person, who comes up in the trees with every group, explained that the beginner level course was never more than about 15 feet off the ground and this helped people like me get used to some of the challenges without having my nervous system interfere with my ability to do the course. It allowed me to learn the ropes (so to speak) without adding the element of fear of heights into the mix. I loved the way Ramblewild allowed me to do build resilience in a slow stepwise fashion. Part of me had always wanted to try a zip line course and part of me was afraid that I would go to one of these places and look like a chicken. Ramblewild provided the perfect conditions for me to overcome this fear of fear. In addition, after you leave, there is a sense of accomplishment that stays with you and that seems to carry over into other areas of your life. You just feel a bit bolder and more daring after you face down a fear like this. Now, I want to go back and try the other beginner level challenges, and see if I might even be ready for the next level. Jeffrey Wyant, Tim Gallagher, Jim Porter and Mike Duffy.